So much life has happened in the last four and a half months that I think I’m still trying to emotionally catch up with it. Major life events like weddings, babies, graduations and funerals of people I have loved deeply have all been crammed into a small amount of time, and it seems like every weekend I’m either celebrating or mourning or just processing a major change. Meanwhile, in the midst of all the craziness, if I’m completely honest with myself, this has easily been one of the most refining seasons I’ve ever been in. I realized in the last couple of weeks that I think I had felt cheated out of springtime this year. I’ve always felt like God pushed the reset button when spring hit, and new beginnings in my spirit mirrored the budding of new life, springing up in creation after a barren winter. But this year, I still felt barren. Wildflowers taunted me on the side of Texas highways, blooming for no good reason, while my heart felt like a graveyard of dreams. I took a risk on a job that had been kind of in turmoil, and I was fearful that things wouldn’t turn out the way I had hoped. Things I had been believing for and fighting for in my spirit for a long time felt like they were fading away into the night. One of my oldest friends is walking through one of the darkest seasons I’ve ever watched anyone I love walk through, and carrying that feels heavy and, in all honesty, pretty hopeless at times. What do we do when we feel like we’ve failed, or like life has failed us? How do we respond when we took a risk and stepped out in faith, and it feels like we’ve crashed and burned? What’s my attitude toward God when I felt like He invited me into this place, and now I feel like I’m being fed to the wolves? Where do I place my faith and my hope when hopeless circumstances tempt me to place it anywhere but with God? These are the questions that have kept me awake at night in this season of my life. Five years ago, I was flying from Houston to Nashville, where I would then meet a friend from high school and drive with her to North Carolina, where we were spending the next month working at Young Life camp together. Um… excuse me? 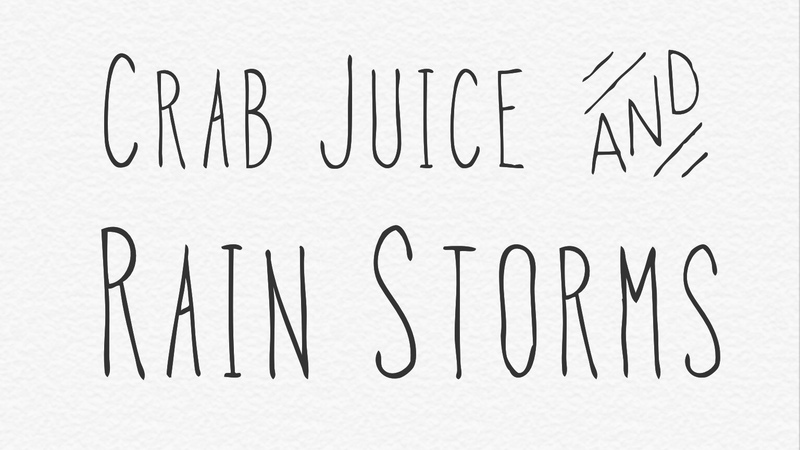 Crab juice? That’s a thing? You’re telling me that’s a thing that actually happens? Apparently, yes, sometimes when you fly from a coastal city to an inland city, there might be sea creatures traveling with your luggage. And sometimes those sea creatures do a little too much wiggling and their box spills over onto your bag. Luckily, Southwest Airlines being as great as they are, gave me a new bag that was nicer than the one I had in the first place, and gave me a one-way flight voucher for the inconvenience. But I still had to clean up the mess that was all over my clothes. It was as disgusting as you can imagine. AND, I had to wait until I got to my sister’s house in Knoxville that evening to wash anything that got spilled on, so keep in mind that by the time I get to my crabby clothes, they’ve been sitting in all of their crabbiness all day. In the last few weeks, I’ve kind of felt like I’ve been cleaning out that bag again in my spirit. Life has spilled all sorts of messes that I didn’t necessarily do anything to provoke, and certainly didn’t ask for, but here I am nonetheless, trying to figure out how to clean it all up. A few weeks ago, I’d had a really hard week. Things were hard at work, things were bad with my friend who’s been walking through a dark time, it happened to be the anniversary of another friend’s death, and grief is just a journey that never seems to end on this side of heaven. I went to the doctor that Friday to figure out some hormonal imbalance I’d been dealing with (hormonal imbalance in already shaky circumstances is also not fun, by the way). He ended up going in to this long spiel about the likelihood (or lack thereof) of me being able to have babies if we didn’t get things regulated. I guess that was just the straw that broke this camel’s back, because I came home from that appointment and absolutely lost it. I sat on my couch and buried my face in my great, great grandmother’s quilt to mask my sobs. I couldn’t even tell what I was so upset about, but I knew it was all coming up, out of the deepest, darkest corners of my heart, and I couldn’t stop it. Was it just all the things I’d been carrying piling up and finally being too much to hold? Was I grieving the babies I didn’t even know I longed for so deeply until the doctor told me they may not come? Was this just those imbalanced hormones making me feel a little crazy? There was a sudden sense of peace in the room. There was a reminder that He already paid the price to win every fight I’ll ever fight, to grieve everything I’ll ever grieve, to carry every burden I’ll ever hold. There was a reminder that resurrection only comes if death precedes it. A reminder that it’s goodbye that makes way for hello. There was a reminder that Adam and Eve’s goodbye from Eden is what will allow all the rest of us to say hello to the heavens one day. A reminder that the Israelite’s goodbye to Egypt made way for a hello, Canaan. There was a sense that Mary’s tearful goodbye to her best friend who hung on the cross on Friday made way for that glorious, hopeful hello to the King of the Universe on Sunday. Sometimes life spills messes on us that we have to clean up as best we can. Sometimes when it rains, it pours, and in seasons like that I have to believe that the old saying “April showers bring May flowers” is true. And this week, how gracious is the timing of God, to remind all of us that He already won. That we can toss out the baggage we’ve been carrying altogether, crab juice and all, and travel lighter with Him, knowing that He already cleaned that mess up anyway. Jesus wore that mess so that we don’t have to. I’m not sure what kinds of “hellos” are on the other side of the goodbyes I feel like life is forcing on me in this season, but I know my life was paid for in full on that cross, and I know that there is nothing that God can’t resurrect. That’s the thing about death in the Kingdom of God. Death isn’t final. It’s just a portal to whatever’s next. So bring on the rain. May flowers are coming next. It’s a promise. This is a wonderful post. I too have been in a very tough refining season. The point you make about death preceding resurrection is so true and the crab juice is hilarious! Who would’ve thought?! Lol have a great week.